Parliament voted “no” to ACTA. It means this agreement will not enter into force in the EU. 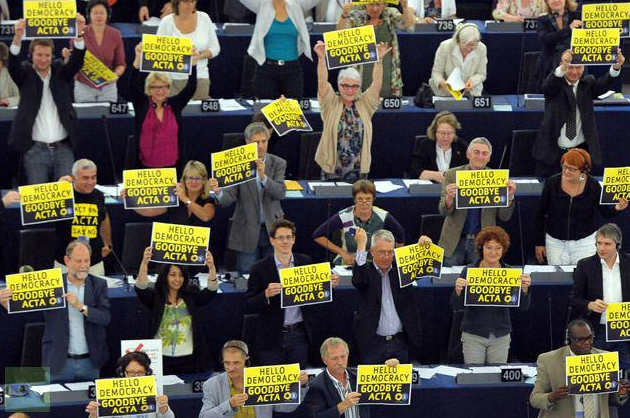 The European Parliament just decided to cancel ACTA! After the final voting the ACTA agreement was downvoted by a large percent of the partiliament. This means that the deceptive treaty is now dead globally. The EU Parliament has received well over two million signatures to protest the Acta, partly because of fear of freedom on the internet will be limited. – If we are to have an elected parliament in Europe to represent the citizens, it is really fine that Parliament may take the public’s concerns and opinions into consideration when making their decisions. It’s a very strong day for European democracy, says Amelia Andersdotter (Pirate Party). 478 people voted against ACTA today. Only 39 voted in favor, while 165 abstained. Poor countries can continue to get cheap medicine. Our Internet service providers do not need to snoop on their users even more than they have to do now. Linux users can still get to watch DVDs on their computers. Bittorrent does not become illegal. And hopefully you will not let customs agents search the hard drive of your laptop for unlicensed MP3 files. The fact that this happened just on the 4th of july was probably just a coincidence. ACTA is a controversial trade agreement designed to stop copyright infringement, both in terms of physical piracy and the Internet. Proponents believe that the agreement is an intellectual property protection, and a necessity for the future. While opponents say that it is at the expense of civil liberty and privacy, and that it primarily benefits large companies. Previous: Who 'Really' Invented the Ipad? Next: What if every company was as generous as Dropbox?